Cast aluminum blends the excellent corrosive resistance of aluminum with the classic charm, detail and style of hand cast furniture. These pieces are created by pouring molten aluminum into handmade castings. The parts are then assembled to create beautifully detailed solid aluminum furniture pieces. 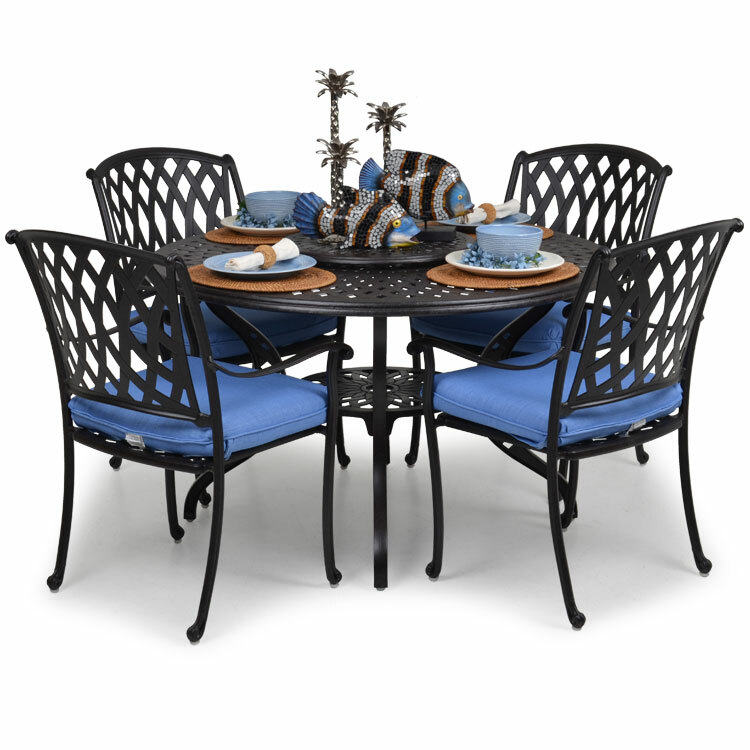 Aluminum patio furniture should last a long time and with proper maintenance, even longer! Here are some basic things that can keep your furniture looking new. Always wear eye and skin protection to prevent liquid or other materials from entering your body. To remove stubborn dirt or stains from the frame or heavy soiling that has accumulated over time, clean the furniture with warm soapy water and use a soft bristle brush if needed. In coastal areas near saltwater or saltwater pools, rinse the cast aluminum at least once per month to prevent salt buildup. This is especially important if the furniture is under cover and not exposed to natural precipitation. Not rinsing off salt buildup may cause premature finish failure and will void the warranty. DO NOT USE A PRESSURE WASHER TO CLEAN YOUR FURNITURE. IT WILL VOID MOST FACTORY WARRANTIES. The force of compressed water can damage or remove the finish and could harm the fabric. Tossing patio furniture in a freshly treated pool IS NOT recommended. This can cause long term problems for both your furniture and your pool! After a soaking rain or anytime the cores of the cushions get wet, it is best to stand the cushion on end to allow water to drain more quickly. This will help prevent mold and mildew growth between the frame and the cushions. Spot wash the fabric to clean spills by using a sponge or a soft bristle brush with a warm soapy solution of mild detergent (dish washing soap works well). Brush or sponge the soiled area and rinse thoroughly with fresh water. Allow cushions to air dry and repeat as necessary. DO NOT MACHINE WASH OR MACHINE DRY THE CUSHION CASINGS/COVERS. DOING SO MAY DAMAGES THE SEAMS OF THE CASE OR EVEN SHRINK THEM, MAKING IT IMPOSSIBLE TO RESTUFF THE CUSHION CORE! Warranties listed on this document are not exhaustive and will be serviced at our discretion. All warranties described herein apply to residential use only. These warranties are intended to provide a remedy for damage or failure resulting from a manufacturer defect. Conditions resulting from abuse, neglect, improper care or usage, accidents, normal wear and tear, or acts of nature are not covered. Fading, pilling and soiling of fabrics is not warrantied. Furniture used in a commercial setting is not covered under the warranties described here. For more information regarding warranty service and specific service or warranty related issues, please feel free to contact us by email at solutions1@leadersfurniture.com or by toll free telephone: 877-538-5783.